Identification. Hungarian derives from Onogur, a Bulgarian-Turkish tribe's self-name. Between the sixth and eight centuries C.E. , both the Hungarian tribes and the Onogurs lived just northeast of the Black Sea. Location and Geography. Hungary is a landlocked country in central Europe. Covering an area of 35,934 square miles (93,030 square kilometers), the country is in the Carpathian Basin, surrounded by the Carpathian Mountains, the Alps, and the Dinaric Alps. The Danube River divides Hungary and bisects the capital, Budapest. Hungary lies within the temperate zone and has four distinct seasons. Demography. Hungary has lost population since the early 1980s. The population was 10,065,000 in 1999, 48,000 less than it had been a year earlier. As in several European countries, the population of the elderly is on the rise and that of children on the decrease. The officially recognized minorities are Armenians, Bulgarians, Croats, Germans, Greeks, Poles, Romanians, Roma (Gypsy), Ruthenians, Serbs, Slovaks, Slovenes, and Ukrainians. The largest minority is the Roma, who make up about 5 percent of the population, numbering approximately 500,000. The second largest minority are the Germans, who number an estimated 170,000. There are 80,000 to 110,000 Slovaks as well as about 35,000 Croatians, 15,000 to 25,000 Romanians, 80,000 to 100,000 Jews, and 5,000 Serbs. Linguistic Affiliation. Hungarian belongs to the Ugor branch of the Finno-Ugric language family. Before World War II, German was the most important and frequently used second language. During the socialist period, Russian was mandatory in schools and universities. English has become the most valued second language, particularly for younger people with entrepreneurial ambitions and in academia, the sciences, and various businesses and services. Symbolism. The Hungarian language constitutes one of the most significant national symbols. History also has a central meaning in national awareness and identity. Related to history is the national coat of arms, which depicts the House of Árpád's Árpád led the Hungarian conquest in 896 C.E. and his offspring founded the state and ruled until the male line died out in the early fourteenth century. On this family crest is the crown that national tradition connects with the person of King István (997–1038) (Saint Stephen), the country's first Christian king. This crown, usually called Sacred Crown or Holy Crown, has always been endowed with a mystical and transcendent meaning. Historically, the crown validated and legitimated the ruler. Even though the kingdom of Hungary ceased to exist in 1918, the crown continues to hold deeply meaningful national significance. The red, white, and green flag also is a powerful national symbol. The national anthem, written in 1823, is symbol of the eastern origins and history of the Hungarians in the form of a prayer that begs God to help the nation. The gigantic painting entitled "The Arrival of the Hungarians" is another national symbol. Feszty originally painted it for the millennial celebration (1896). music, folk culture, folk literature, folk traditions, and history. A deep, permeating consciousness is another integral element of national identity. It can be summarized as "we are all alone" and is based on historical reasons and the "otherness" of the language and the origins of Hungarians. While the consciousness of "we are all alone" was dormant during the socialist period (1948–1989), it still remained a recognizable and crucial part of the national identity. Emergence of the Nation. There is evidence that the Hungarian nation was a unit in the Middle Ages. In Latin chronicles dating back to the tenth century, there are colorful origin myths of the Hungarians "conquering" and occupying the Carpathian Basin and their conversion to Christianity under King Stephen. Many Hungarians consider their nation "the final fortress of Western Christianity and civilized Europe." National Identity. In the Middle Ages, groups and nationalities that were not ethnically Hungarian lived in the nation. After the late Middle Ages, a dual national consciousness is demonstrable. On the one hand, there was a nation–state that ethnic Hungarians and non-Hungarians could share. On the other hand, there was a narrower sense of belonging to the Hungarian linguistic, cultural, and ethnic community. 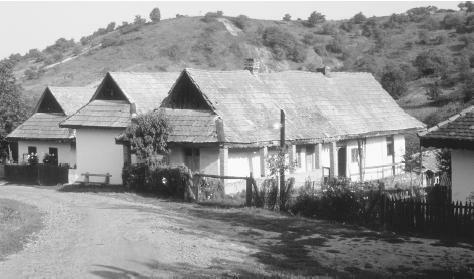 Houses in the village Holloko in northern Hungary in 1980. At the end of the twentieth century more than half of Hungarians grew food for their own use and for supplemental income. time there were anti-Habsburg revolts, conspiracies, and political unrest. The Austrian tyranny that followed the revolution of 1848 ended with the 1867 Austrian-Hungarian Compromise. With this accord, the Austro-Hungarian monarchy was established. The Austro-Hungarian monarchy ended after World War I. The Trianon Treaty of 1920 ended the territorial integrity of Hungary. Nearly 70 percent of its historical territory and 58 percent of its former population were ceded to neighboring countries. One-third of ethnic Hungarians came under foreign rule. With the assent of the Western powers, Hungary came under Soviet occupation after World War II. Under the leadership of Moscow and the Moscow-led Hungarian Communist Party, the "building of socialism" began. In 1956, the nation rose up against the Communist rule and occupation by the Soviet Union. The revolt was defeated and approximately two hundred thousand Hungarians, mostly young people, skilled workers, white-collar workers, professionals, and intellectuals, escaped to the West. By 1968 Hungary had become the "happiest barrack in the lager" as a result of the economic reforms of the New Economic Mechanism and with some social and political liberalization. In 1989, Hungary was the first Socialist Bloc country to open the "Iron Curtain," providing a transit route for thousands people emigrating from East Germany to West Germany, precipitating the fall of the Berlin Wall and the reunification of Germany. The "softer" regime under János Kádár was successful in weakening traditional national consciousness, along with previously closely knit community networks and religious worldviews and values. After forty years of socialism, the general tendency among many in the population is to be individualistic, survival-oriented, and likely to work out strategies of compromise. Ethnic Relations. After the 1989 change of regime, the Hungarian government assumed responsibility for the ethnic and linguistic maintenance of ethnic Hungarians living outside the nation's borders. The government tries to establish and maintain fair and friendly relations with the governments of neighboring countries. There are frequent complaints, however, that the Hungarian minorities' ethnic and cultural maintenance is made difficult by the host countries. Hungary continues to strive for friendly relations with the surrounding countries. Ethnic and national minorities are encouraged to set up their own self-governing councils, and their cultural and educational institutions receive state support. Among the minorities, the Roma are in an extremely difficult situation. Their high birth rate, disadvantageous economic position and social status, and the subjection to prejudice have worsened their economic circumstances and social integration. Until the middle of the nineteenth century, Hungary was a primarily rural agrarian society. Often Hungarian villages had large populations. The church was always in the center of the village. Many settlements were "two-church villages," indicating that two groups settled there at different periods. On the Great Hungarian Plain instead of villages, there was a loose network of huge agrotowns that were located far from one another, each with a population from 20,000 to 100,000. Until recently, most Hungarians engaged in agriculture. The large agrotowns were administered as villages, with most of their inhabitants living like peasants. In the early eighteenth century, individual, isolated homesteads sprang up. Only seasonally occupied at first, they eventually became permanent residences of mostly extended families. However, even though about 50 percent of the people in the agrotowns lived and worked outside towns on these homesteads, they still considered themselves townspeople. As a result of industrialization after the establishment of the Austro-Hungarian monarchy in 1867, a number of industrial-commercial-merchant cities sprang up. Between 1867 and the beginning of World War I, Budapest grew into a huge metropolis with a population of over a million. In the center of cities there are city halls and other public buildings as well as churches, shopping districts, and remnants of traditional marketplaces. Some churchyards still have small cemeteries. Until recently, it was customary to have a tiszta szoba (clean room) in peasant houses that was used mainly for special visits and particular rituals and occasions such as births, christenings, weddings, and funerals. There were also "sacred corners" that were decorated with pictures of various saints and pictures and statues brought back from Catholic pilgrimages. In Protestant households, the walls of those rooms depicted religious reformers and the heroes of the 1848 revolution. Food in Daily Life. Magyar kenyér (Hungarian bread) remains very important in the rural and urban cuisine. For the last one hundred fifty years, wheat has been one of the most important crops both for domestic use and exportation. Pig breeding became the most important type of animal breeding in the 1870s, and since then the meat and byproducts of pigs have predominated in the national diet. Food Customs at Ceremonial Occasions. The cuisine at most village weddings includes chicken soup with special csiga noodles that were traditionally believed to have fertility-inducing properties, gulyás , stuffed cabbage, sweetened millet, sweetened rice and other rice dishes, and butter-cream tortes and other baked goods. According to the national self-image, Hungarians are wine drinkers, but beer drinking is more common. Since the early 1990s there has been an attempt to familiarize the population with regional wines. Basic Economy. Before World War II, Hungary was an agricultural country. During the socialist regime, forced industrialization took place. However, more than half the population does some agricultural work for household use and supplemental income. Major Industries. Tourism continues to be a great Hungarian success. The production of barley, corn, potatoes, wheat, sugar beets, and sunflower seeds, along with grapes and wine making, is important. Mines are no longer subsidized by the government, and many mines have closed. Trade. Imports include metal ores and crude petroleum, while exports include agricultural products, consumer goods, leather shoes, machinery, transport equipment, chemicals, textiles, wines, iron, and steel. The towns of Buda and Pest (shown in 1995), on opposite sides of the Danube River, joined to become Budapest in 1873.
trading partners have been Germany, Italy, Austria, the United States, and some of the formerly socialist countries. Classes and Castes. Early in the socialist period, the nationalization of industries, commerce, and most services, along with the forced collectivization of agrarian landholding, brought about the end of private property. Communist Party leaders, secretaries, and members lived better and had access to more goods than did the rest of the population. Privatization of industry, commerce, and some services took place after 1990 as Western capital flowed into Hungary. As a result of a complex and controversial system of property compensation, most arable land and real properties were reprivatized after more than four decades. The income gap then widened between the rich and the poor. It increased in 1998 as 38 percent of the population earned below the minimum annual wage. In contrast, the rich seem to have increased their wealth at a rapid rate. Upward social mobility still depends on the channeling of students into educational institutes. A disproportionate number of students in high schools, colleges, and universities come from intellectual, upper management, or otherwise "elite" families. Symbols of Social Stratification. Western-style clothes, especially American jeans, are worn by the bulk of the younger population in both urban and rural areas. New clothes are very expensive and brand names such as Levi-Strauss can be bought only by a small segment of the population. Shiny polyester or nylon leisure suits worn with expensive, name-brand sports shoes are signs of new and successful entrepreneurs. Many of the new rich drive expensive foreign cars. The number of cell phones and their frequent and public uses are striking. There are numerous luxurious new or elaborately remodeled villas in Budapest that are owned by the new economic elite. Foreign travel has become a flaunted symbol of wealth and status. Government. All levels of government were under the control of the Communist Party between 1948 and 1989. The change of regime in 1989 brought in a multiparty government and a parliamentary democracy with elected representatives. At the end of the twentieth century, there were 182 officially registered political parties. 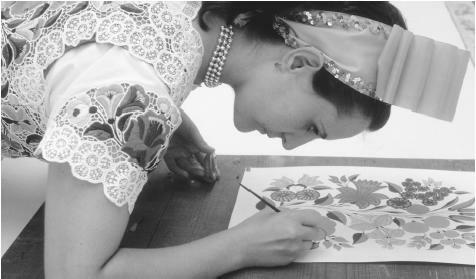 A woman paints a flower design which will be used to make a traditional Hungarian dress in Kalocsa, Hungary. Leadership and Political Officials. There is a president, who is the head of the state and may be elected for two five-year terms. The prime minister is the leader of the party with the most seats. The parliament is called the National Assembly, with 386 deputies who are elected for four-year terms. The Constitutional Court was established in 1990. There is a Judicial Supreme Court that is essentially a final court of appeal. Social Problems and Control. Alcoholism is a widespread and significant problem. In addition, drug abuse has increased since the end of the socialist regime. After the outbreak of the war in the former Yugoslavia in 1991, Hungary became a favorite place for international organized crime organizations that engage in drug, weapons, and people smuggling; prostitution rings; and money laundering. The crime rate is rapidly increasing. The population worries about the lack of public safety and generally blames crimes on the Roma as well as refugees and other foreigners. Psychological problems, particularly depression, increased significantly between 1988 and 1996, and, although the number of suicides has been declining, Hungary continues to have the highest rate of suicide in the world. Military Activity. Modernization of the army began in the early transition period (1990–1994) and has continued since the country has become part of the North Atlantic Treaty Organization (NATO). There is an ongoing process of integrating the Hungarian armed forces with NATO organizations and the filling of alliance posts. The army is being converted to a mixed structure that is composed of volunteers and conscripts. All males between ages 18 and 55 are required to serve in the armed forces, but conscription is selective. For example, students in universities serve for a very short time or not at all and conscientious objectors are given civilian jobs. There are 80,000 people serving in the army, air force, border guards, and the small fleet guarding the Danube River. Division of Labor by Gender. Men are expected to work, earn, and provide for their families, while women are expected to take care of the children and the domestic chores. These ideal roles are rarely achieved today. In the last couple of generations, the rate of divorce and remarriage has increased dramatically. Since the change of regime (in 1989), cohabitation of unmarried couples and the number of children born outside of marriage have grown. These patterns are more common among those with less formal education, money, and social prestige. Most Hungarian men do not help with the housework, and few women object to this arrangement. Only among a small percentage of young, mostly urban couples and an even smaller segment of middle-aged intellectuals and professionals is there evidence of a changing pattern in the gendered division of labor in the domestic sphere. The Relative Status of Women and Men. The images of the mother and motherland are expressed in the national literature and culture. Since the early nineteenth century, the centrality of the mother-son relationship has been idealized in literature and the public consciousness. The mother is often hailed as the core of the national identity, the guardian and cultivator of a "real" culture that is untouched by foreign influences. Marriage. Marriages are no longer arranged. Young people usually marry for love or to have children. The perpetual shortage of apartments is a problem for married couples. Young married couples frequently move into the small apartment of either set of parents. While traditionally a young married couple lived near the parents of the groom, today, if a couple cannot set up an independent new household, they move in with the set of parents who will welcome them and has the most room. Most households consist of a married or unmarried couple and their children. Even when a couple lives in a separate household, great value is placed on having the help of a grandmother or grandfather. Kin Groups. Kin groups are often large in villages and smaller in urban centers. Godparenthood is still much valued. Extended families living in the same household are very rare. Infant Care. Traditionally, newborns were swaddled; today they are wrapped in warm blankets when they are very young, but swaddling is no longer practiced. Infants and toddlers are usually put into a separate space to sleep and play. Parents try to calm an active baby rather than stimulate it. There seems to be a growing child centeredness that is manifested in focusing on children and often giving them more material goods and privileges than the family can afford. Good children are obedient, mindful, diligent, respectful, industrious, quiet, and good students. In rural areas, more emphasis is placed on respect and industrious behavior. The actual behavior of children rarely approximates these expectations. Child Rearing and Education. Formal education is compulsory between six and sixteen years of age. The rate of literacy is 98 percent. Traditionally, most people considered a high school diploma as the final formal educational goal. Higher Education. Since the 1980s more value has been placed on college or university education. This is illustrated by a slightly increased enrollment in colleges and universities and in an expansion of educational opportunities in institutes of higher learning. Hospitality entails an extraordinary effort to feed and care for guests. Guests are always encouraged to step into one's home first. Friends, family members, and close acquaintances who have not seen one another for a while greet and part from one another with pecks on both the left and right cheeks. Touching the hands, arms, and shoulders of partners in conversation is common. It is customary for a woman to offer her hand first both to men of all ages and to younger women and children. Differentiated formal terms of address are seldom used among younger people. Informal styles of greeting and terms of address are used from the moment of initial meeting. Considerably less time is spent visiting and socializing in coffeehouses and on the streets than in the past. Bodily contact is rather intimate on public transportation and in malls and shopping centers. In isolated rural settlements, villagers still stare at strangers. Hungarians frequent the Szechenyi Thermal Baths in Budapest and other spas to promote good health. about 2 percent are "nondenominational" or "other." After Russia, Hungary has the largest Jewish population in its region. About 80 percent of Hungarian Jews live in the capital city. About half the Jewish population is over the age of 65. There was an official campaign against all religions during the socialist regime. Those who openly practiced a religion were discriminated against and often punished. The state closed most parochial schools and dissolved or disbanded religious orders and institutions. After 1989 and during the periods of privatization, many schools and other formerly parochial buildings were returned to the churches. As compensation for the confiscated properties, the state financially supports parochial schools and other religious institutions. Among large segments of the population, religious indifference and often explicitly antireligious attitudes prevail. This is an outcome of the lax, individualist, atomizing policies of the last decade of socialism. Alongside the major denominations, there are an increasing number of small sects, religious movements, and Eastern religious practices, along with a growing number of followers of proselytizing Western missionaries. Many Hungarians do not formally belong to or regularly practice any religion, but baptisms, weddings, and funerals tie them informally to churches. Rituals and Holy Places. Among the sacred places of the Hungarian Roman Catholic Church are the city of Esztergom, where Saint Stephen was born; Pannonhalma, where the first Benedictine Order was founded in 996 C.E. ; the city of Eger; and a number of provincial rural settlements and places of annual pilgrimage. 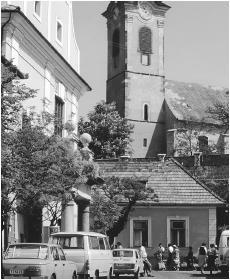 Calvinists in eastern Hungary consider Debrecen the "Calvinist Rome." The religious centers for Lutherans are Budapest and Sopron. Budapest has the largest synagogue in Europe. Death and the Afterlife. In addition to traditional in-ground burial, cremation with special places to put funerary urns has been practiced since before World War II. Because of a lack of cemetery space in the cities and the great expense of traditional funerals, cremation is widely practiced. Western medicine is practiced, although many individuals have turned to alternative medicine such as acupuncture and herbal and homeopathic remedies. In addition to Western medical treatment, frequenting medicinal spas, getting professional deep tissue and other types of massage, and drinking mineral water continue to be very popular. Major national holidays include 20 August, commemorating the death of King Stephen. This day is also an ecclesiastical feast day. During the socialist regime (1948–1989), 20 August was renamed the Day of the Constitution and the Day of New Bread. Another major national holiday is 15 March, which commemorates the bloodless democratic civil revolution that broke out in 1848. Since the change of regime in 1989, 23 October has been a day of remembrance of the revolution of 1956, when Hungarians rose against the Soviet occupation. Though not an official holiday, the Day of the Martyrs of Arad (6 October) is a significant time of remembrance. In addition, there are numerous local memorial celebrations, art festivals, and folk festivals. Among the many festivals and fairs are the southern Folklore Festival along the Danube, the northern region's annual Palóc Festival, and the annual Bridge Fair. In the annual Budapest Spring Festival, there are art exhibits and musical and theatrical events. Support for the Arts. Support for the arts during the socialist period was provided primarily by the State. Since 1989, there has been much less governmental support and more private, individual, and corporate sponsors for artists. The physical and social sciences are taught on sophisticated and advanced levels in universities, research facilities, and other institutes. State funding continues to be a key resource, but it has decreased in the last decade. There has been a "brain drain" as younger and middle-aged scientists leave temporarily or permanently for better wages and opportunities and more advanced laboratories and instruments in Western Europe, the United States, Canada, and Australia. Bárány, George. Stephen Széchenyi and the Awakening of Hungarian Nationalism . 1968. Remnants of past centuries such as this clock tower still dominate many towns. ——. "Hungary: From Aristocratic to Proletarian Nationalism." In Peter Sugar and Ivo Lederer, eds., Nationalism in Eastern Europe , 1969. Bibó, István. Democracy, Revolution, Self-Determination. Selected Writings , 1991. Csalog, Zsolt. "'We Offer Our Love': Gypsies in Hungary." New Hungarian Quarterly 33, (127):70–80, 1992. Csepeli, György. Structures and Contents of Hungarian National Identity: Results of Political Socialization and Cultivation, , 1989. ——. National Identity in Contemporary Hungary , 1997. Crowe, David. "The Gypsies of Hungary." In David Crowe and J. Kolsti, eds., The Gypsies of Eastern Europe , 1990. Deák, István. "Uncovering Eastern Europe's Dark History." Orbis , Winter 1990. ——. Beyond Nationalism: A Social and Political History of the Habsburg Officer Corps, , 1992. Erõs, Ferenc. "The Construction of Jewish Identity in Hungary in the 1980s." In Ferenc Erõs, David Schers, and David Zisenwine, eds., Yitzak Kashti, A Quest for Identity: Post War Jewish Biographies. Studies in Jewish Culture, Identity and Community, School of Education , 1996. Fél, Edit, and Hofer Tamás. Proper Peasants: Tradtional Life in a Hungarian Village , 1969. Fenyõ, MarióD. Hitler, Horthy and Hungary , 1972. Gerõ, András. Modern Hungarian Society , 1995. Gombár, Csaba, Elemér Hankiss, László Lengyel, and György Várnai, eds. The Appeal of Sovereignty: Hungary, Austria, and Russia , 1998. Hanák, Peter, ed. The Corvina History of Hungary: From Earliest Times Until the Present Day , 1991. Hofer, Tamás, and Edit Fél. Hungarian Folk Art , 1979. Huseby-Darvas, Éva. "The Search for Hungarian National Identity." In Lola Romanucci-Ross and George DeVos, eds., 1995. ——. "'Feminism, the Murderer of Mothers': Neo-Nationalist Reconstruction of Gender in Hungary." In Brackette F. Williams, ed., Women out of Place: The Gender of Agency and the Race of Nationality , 1996. János, Andrew. The Politics of Backwardness in Hungary , 1982. Jászi, Oszkár. The Dissolution of the Habsburg Monarchy , 2nd ed., 1958. Kereszty, András, ed. The Reliable Book of Facts Hungary '98 , 1999. Kis, János, Politics in Hungary: For a Democratic Alternative , 1989. Kisbán, Eszter "Parasztételbôl nemzeti jelkép: A Gulyás esete 1800 körül [From Peasant Food to National Symbol: The Case of the Gulyás]." Janus IV. Kolosi, Tamás, István G. Tóth, and György Vukovich, eds., Social Report 1998 , 1999. Kontra, Miklós. "Hungary." In Sprachkontakte in Mitteleuropa Kontaktlinguistik, Hans Goeble, Peter H. Nelde, Zdenek Stary, and Wolfgang Wolk, eds., 1997. Kuti, Éva. Hivjuk talán non-profitnak [Perhaps We Ought to Call It Non-Profit] , 1998. Lázár, István. An Illustrated History of Hungary , 1995. Lukács, John. 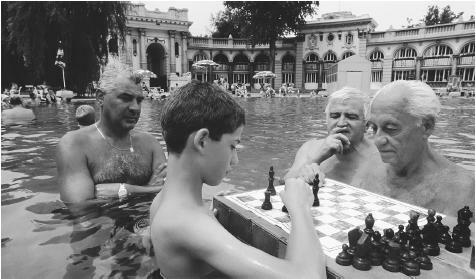 Budapest 1900: A Historical Portrait of a City and Its Culture , 1988. Makkai, Ádám, ed. In Quest of the Miracle Stag , 1996. McCagg, William O. Jewish Nobles and Geniuses in Modern Hungary , 1973. Macartney, Aylmer C. National States and National Minorities , 1934. Örkény, Antal, and Mária Székelyi. "Justice and Legitimacy: Post-Transformation Trends in Eastern Europe." In Kolosi, Tóth, Vukovics, eds., 1999. Szathmáry, Lajos. "How Festive Foods of the Old World Became Commonplace in the New, or the American Perception of Hungarian Gulyás." Oxford Symposium on Foods and Eating Habits Proceedings 2(1):137–143, 1983. Hi, my name is Zach Kiss, im 18 years old and i was observing this article for a project i am doing for my sociology class. I thought it was a very good source to use with the amount of information provided. I am a quarter Hungarian myself but have never really studied the Hungarian culture. My grandfather is Hungarian and was in WWII, a very knowledgable man, but I have never asked him alot of questions about his background..I was told by my father that our last name "Kiss" is common in Hungary and pronounced (Ki-sh). Here in the states everyone loves the last name because it's spelled exactly like the affectionate kiss.haha.. Beside the point I was just commentting to see if i could receive some facts about my last name "Kiss" and what significance if any it had. Thank you for taking the time to share this information with me and i will appreciate your responce. This is a great source of information on the Hungarian culture. My husband "Attila" is from Hungary. We visited last year for a family reunion. This article is pretty accurate in my opinion. I also apprecaite the way it is organized. Very easy to read. I'm dating a hungarian man, and my mother have a cousin whose husband was from Hungary. I'm very interesting in knowing more about this country ! I like how this site is organized. I am hungarian and I thought this was a great place to know about my heritage. My last name is also hungarian and I hate it when people make fun of it. To my knowledge I have only met one person so far in my life with the same last name as me besides my family. I have not seen her since kindegarden. I am very happy to have hungarian run in my family (dad's side) because I think it is a unique country with a very big background. I can't wait to actually start learning the language and actually go their to see if I have any relatives and to explore the country. I thought the information provided was very good and I am writing an English paper on my great-grandmother whose was Hungarian along with her husband. Interestingly enough her name was Elizabeth Horvath and I noticed someone else had that last name that commented on this piece of information. I wonder if somewhere in the line we are related. I'm Reka from Hungary. To answer the questions listed above: Kiss and Horváth are among the most common surnames in Hungary. (Kiss means 'little' and Horváth derives from horvát meaning a person coming from Croatia. Very well written, Hungary is beautiful any time of the year,That why it's clled the Paris of Eastern Europe. There are a hand full of people that knows the secret. What an adventure. Thanks for the info. I'm preparing an assignment on cultural diversity for a specific module, I decided to choose my own culture for selected research and in doing so have discovered many aspects of being Hungarian I did not know, now I can sling some historic info at my all knowing about being Hungarian brother, I'm sure he has missed this page. Hi, I have known I am 3/8 Hungarian for a while but have just recently become interested in my heritage. This is a great article and very helpful. I was wondering if anyone here knows of any Hungarian clothing websites where the shirts have Hungarian text on them. Anything I find on google isn't what I am looking. Thanks! I am interested in the history of Hungary about the period 1885 - 1900. It was about this time that my grandparents emigrated to the US. The setlled in the area of Middlesex County, Raretin Township New Jersey. I am looking for information on typical life at that time and for about the 50 years previous. Specifically, I'm looking for information on; what they ate, politics, social structure and norms, natural medicine, traditions, etc. I want to document some of these things about my grandparents for my children and grandchildren. Any references you could provide would be greatly appreciated. Hey my name is Krisztina, as you can see it is spelled the way people in Hungary spell it also. Also, if you hadn't figured it out already I am a full Hungarian and I have been raised in the country for half of my life. School in Hungary is extremely hard and stressful. Also I don't mean to be ruse but to I would like to make a comment about how Hungarians tend to greet each other. While it IS true that the older Hungarian people do tend to greet each other with two kisses ( one on each cheek ) teenagers are more likely to greet each other with not two but three kisses: left then right and then left again. I, like many of the others that have read the information on this site, find that it has a great deal of information which is for the most part accurate and is very well laid out. I am a Hungarian girl, and I am very happy and proud that you people interested in my country , customs, and history. Thank you to make me feel proud to be HUngarian. I was reading about the hungarian cultures and tradition because my boyfriend is a hungarian. I was thankful for this information it was so clear and easy to understand. Im just curios too with country because where planing to have a family. This is hard work but this an awesome web site for my home work. I appreciated your site. I found it to be full of insider information that I need as someone who is learning alot of my paternal side's Hungarian roots. Thanks. My mother's mother & grandmother came to the United States through Ellis Island around the mid 1900's. They were from the Austria Hungary area is what I was told but the Ellis Island record says Hungary. If you can find out any information from your grandfather like what ship they came here on, full name & correct spelling used, date of birth & anything else you can obtain, you can go to the Ellis Island site & look them up. I tried to copy the link but the site won't allow. Just search free ellis island record search. All I knew was names & luckily I had the correct spelling. I not only found my grandmother but also that she traveled here with her mother & she was only 15 years old. I then found my mom's father who also traveled here with a family member, his brother. They were both in their teens too. It was very interesting & good luck to you in your research. I used this website for a school project i had not long ago. I think it is very well put together and has some very helpful information and it helped me a lot! Thank you. But i also think it might be a good idea to include some more of the traditional clothing that they wore. Thanks! hi my name is Marissa Magyar and my family history is from hungary,so was woundering since my last name is magyar does that mean my family history is famous? or does any of my family history have to do with the country. In 1961 I married Zsigmond Fekete who was born in Debrecen, Hungary. His date of birth was October 29, 1937. I would like to know more about how he lived. He often told me stories of how his father saved their family by adhering to the politics of the day. I also learned that his family was stripped of their land during communist rule. He went to agriculture school and studied wine making and often talked about the wonderful dogs he raised and the horses he cared for. Zsigmond was a parat of the 1956 revolution and emmigrated to the US to Connecticut. He had 3 sisters, one of whom died at an early age. His father was also Zsigmond and his mother was Julianna. I have no idea about any of them and often wish I had some contact. One of my sons and I would love to visit Debrecen and locate some relatives who may still be living there. It would be wonderful if we could make some connection. If anyone can help, I would appreciate that. i'm wondering where my family was from could you please find out for me? My father came to UK in 1956. I have recently found out that his father died in a Russian prisoner of war camp in 1947 after capture in 1944. Anybody with any info about Hungary's part in ww2 would be much appreciated. Also any other Peterffy's oh there? My mother's side of the family is Hungarian. My grandfather's mother was Jewish Hungarian (from Hungary). My grandpa doesn't like to talk about his heritage, because he grew up without either parents with his Hungarian grandfather and (mean) German grandmother (this was during the Nazi times, so most of the remaining relatives were among the many killed in Budapest). I'd love to learn more about the culture, though. What's the best way that I can learn more about Hungarian culture without going there? My great grandfather was Hungarian born in kunstat his name was johan ernst gabony. His father was a tailor with the same name.Would be very grateful for any information regarding this area or surname. Johan came to the uk in approx 1880.Best wishes. My Surname is Harbula i know is found in hungary and slovakia and western ukraine.I beleve its of rusyn orgin if someone knows whats this name means or its origin please let me know thanks. I am looking for a site where I can look up my ancestors from Hungary. I have been on ancestry.com and several other sites with no luck. My grandfather Janos(John)Ondo was born 1/25/1879 in austria/hungary. That is all the info I have. Im doing a report in school and i need to do a works cited page. i used this site and im just wondering the author of this cite. thanks. This is a great site, there is much useful information about Hungarian culture, economy and others. I would love to visit Hungary sometime! My name is Zoli and I am a Hungarian guy living in Canada. You were asking about the meaning of your last name "Buzay". The word "buza" means "wheat" in Hungarian. The word "buzai" means "from the wheat" or from the "fields of wheat". Therefore your last name "Buzay" is probably an older form of the word "buzai". I guess you could just say that the approximate English equivalent of your last name is "Wheaten". hi! Thank you very much for this article which is very informative and reliable! I`m from Kyrgyzstan(Central Asia). Recently I visited this amazing country and fell in love with Budapest! I think people there are very friendly(I can`t believe that alcoholism and suicide are common problems there! 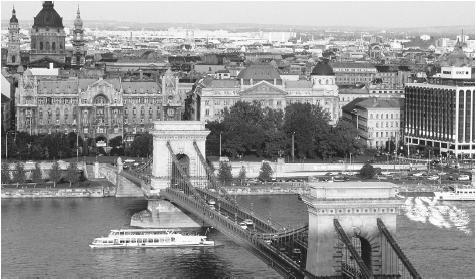 ), their food is very delicious and most importantly - I love the city of Budapest and river Danube! Good website, but maybe you should had some more about the culture when Hungary was a dual monarchy with Austria. I'm having a hard time finding good information about Austria-Hungary other than the rise and fall of it. the most popular sport in hungary is still football(soccer), howewer our teams are really bad these years, not like in the 1950's. My papa was from szombathely Hungary. He has passed away but I love to read and learn new information on the history and culture of Hungary. I wish to one day visit this beautiful country.This was a very good Web site. My name is Nora, I am from Budapest, Hungary. I guess your "Great-great" Grandma's name was in Hungarian "Kálmán Ilona" and your "Great-great" Grandpa's name was "Kálmán József". (The name is reversed in Hungarian)Their last name "Kálmán" is in fact a male given name in Hungarian. Anyway, "Kálmán" has Hungarian-Turkish origin, this means "alive", "surviving". Florence is in Hungarian "Flóra" and it means "flower" in English. I just wanted to say my english teacher showed us this sight for our project we had to do. I am part Hungarian i think its from my dads side. but all i wanted to say is that this is some really good information. My surname is Oboczky/Oboczki and I was wondering if anyone knew of a way I could find out more about how the surname could have com about. My ancestors were from Nyiregyhaza, but there were about 6-7 cities with Baptism records, mainly Szirma-Bessenyo during the 1700 & 1800's. Thank you for that information. It's nice to see that the Hungarians aren't forgotten. Hi!My name is Vicky and I would like to tellyou of our Hungarian friendship,which has survived through 3 generations.My husband's father met a Hungarian Scout in the early 1930's.They corresponded until WW2 and then picked up again after the War.Sandor,the Hungarian,was allowed to do a Master's in Aberdeen,Scotland so they saw each other then.He was then sent to Paris-to work for Unesco.By then both were married and they met up fairly often. [My husband was a child and had 2 brothers but Sandor had no children. ]Sandor and his wife became part of their family.Sandor had had a pupil[he was previously a Headteacher],who was a heart doctor.He,Attila,was allowed to study at a London hospital but was given NO MONEY to live on.My husband's family supported him for 6 months and regarded him as a member of the family.David,my husband first visited Hungary in 1966 and I went with him for the first time in 1970.We loved the country and the people.We had Attila's daughter and subsequently her children to stay for 2 months and friends of Sandor and Attila have also stayed.It is unusual not to find Hungarians staying with us!We loved the country so much that we now own a holiday home on Lake Balaton.I think this account proves what a wonderful people Hungarians are.To keep a frienship through WW2 and Communism-when it was difficult to have Western visitors and money was tight-is amazing.Really good web-site! Hi. I'm very interested about the last name Petrulak. My boyfriend's last name is Petrulak and he is Hungarian by blood but he and his dad are not sure if that last name is really a pure Hungarian or with Slovakian or Slovenian background as well. His dad once said that his dad (my boyfriend's grandfather) made a mistake registering the birth certificate. He's not sure if it is Petrulak or Petruljak since my boyfriend's grandfather was raised in Slovenia but born in Hungary. If you can give me some information about this details, I will really appreciate it. Thanks so much. I am very interested to know more about typical friendships in Hungary. If someone could respond I would greatly appreciate it. Good write up. I have been in Hungary for some years now, and I am yet to know a language as difficult to learn or speak!! Hungarians seem closed to foreigners with various issues on racism, but when you get closer to some of them, you see a better side. I believe that from their history here, their unfriendly or suspicious nature came from the fact that they fought several wars. They should be more friendly. Anyway, now that the younger generations are interested in learning other languages, they will become more open. I love your site and all of. The work you put into it. I am 1/2 Hungarian and am obsessed with the country and culture. My grandfather and grandmother came to America in 1956 after the revolution. My grandpa used to tell me all about Hungary and stories of the revolution, he was a soldier during the conflict. He always tol me he was going to take me there and show me everything. He died suddenly about 5 years ago but I have decided I'm going to learn all I can about my heritage and take the trip anyways. Thank you for helping me make this dream more possible with the information provided. Also if anyone knows of a good way to try and learn the language it would be much appreciated. My father knows some still but is very much rusty and unfortunately not a very good teacher. Thank you very much. I believe the article is factual and educational. I grew up in Budapest, my parents were Hungarian Jews. During the Holocaust, I lost my father, two brothers and several close relatives. They were murdered by the Nazis and the Hungarian Arrow Cross (Nyilasok). 1956 I escaped from Hungary and resided in the USA. I still visit Hungary, mainly the very beautiful Budapest. I have "mixed memories" from Hungary. The years of 1943, 1944 and until January 1945 when the Soviet Army liberated Budapest, those horrible events can never be forgotten. The other memories are the opposite. I still speak and understand almost perfect Hungarian, I still read a lot in Hungarian and research the Internet about Hungarian news. I enjoy to visit beautiful Hungary, but the rebirth of new Neo-Nazis parties and organizations like JOBBIK and GARDA are very disturbing. Great Information! It really helped in my geography assignment. My great grandparents fled Hungary during WWII when Russia invaded because my great-grandfather was a retired solider of se great standing and a police officer. He fled, the story goes, because he was afraid that the Russians would seek him out and demand to know what secrets he knew. The story goes that they were *very* wealthy and they took anything and everything of value with them when they fled. My great-grandfather's need was Bela Vita. All I know about the last name is that it is. Latin based, which doesn't make much sense, and that it means "vital." My grandmother's name was Eniko Reka Vita. Please, anyone with information about the Vita family in Hungary, please let me know. My email is: ash.jones9548@gmail.com. Please contact me there. Does anyone have any information on Zigmund and Esther Hegedus from Hungary. Came to Canada in early 1900s. Last known to have lived in Sakatchewan. Just wondering if they could have been Jewish Hungarian. These people where my grandparents and I know very little about them and have no other avenue of information. GREAT website. I'm going on exchange to Hungary next year and am trying to learn everything I can about the culture and people. This has been very helpful! Hi! I'm Hungarian, so I'll try to help some people asking for the meaning of their names or other things. @gwendolyn yank: it is spelled "apa, tessék jönni!" and it means, "dad, please come!" and is a bit archaism. @Ashley: vita means argument in Hungarian, but the name could come from the latin vital as you mentioned. Hey, i want to just straight out say this but I LOVE your website! I had to use it for a project in school that I hate because it is so hard to find information but the\is website helped me thanks:)! This article has been of great help to me in understanding Hungary and her rich cultural heritage. moral behaviour and a propensity to suicide. All in all, this article is the best one I have found and read on the subject of Hungary. My appreciative thanks to the author. I am a Hungarian woman living in New Hampshire I grew up in New Brunswick, N.J. where I came to America from Paris, France. I do speak perfect Hungarian as I've spoke all my life. I have never been to Hungary. Both my parents and grandparents were born in Hungary. Unfortunately both my parents are deceased. I have heard so much historical information about Hungary all my life. I almost feel like I've been there. I love the language the food and the culture of Hungary. If anyone is interested perhaps I can help in some small way! Charles - Láng means flame in Hungarian, it is a quite common family name among Hungarians. I am second generation American of full blood Hungarian ancestry. My Grandparents were from Tiszadob, Hungary ,and the Handa name has been somewhat common in this area as far as babtismal records reveal. I am very proud of my Handa surname, but I have been told that it is not a Hungarian surname. If not, can anyone tell me from where this name originated? One of my Grand mothers listed Magyaros,Hungary as her hungarian town of origin. Can you tell me exactly where this place is located? Pretty accurate summary from what I know. I lived in Hungary till age of 10. Now I am back to bury my father who retired here from the states. I have just spent two full days running around making funeral arrangements. And that was with hiring a firm to carry out the funeral! Unreal! The bureaucracy is mind numbing! As for Arpad above, just use google maps. I have been surprised how well the Audi's GPS has gotten me around the countryside. My father was born in Peris, Hungary in 1908. I have been told that in the 1800's when a family moved from one town to another, they took the name of the town as their new family name. I found a town that is fairly similar in spelling to our family name ERCSE that is not too far from the town of Peris where my father's parents lived and where he was born. Is what I was told true.? Did families make this sort of name change? My friend has the surname Turgyan and understands it to be Hungarian. Can anybody provide more information no this, please..? I am trying to find out the real story of my heritage. I know my fathers name is Emil lango and My grandfather has the same same. My grandmothers name is Piroska (sp?) but I waa told our last name was mispelled upon them coming to US. Can anyone perhaps provide some information regarding my last name? It could have been Longo, or some form of that. Hi my last name is Luczi and I was wondering what it means in Hungarian? Hi I came across this website a few years ago and I had been looking for it ever since! I'm so glad I found it! I was wondering what my family's last name means. It is Szuhay. I know it is closely related to the name of a little village in Hungary, Szuha. I'm really interested. The site is great! Love reading the comments also. Our family name is Gonczy/Gonczi and Goncy/Gonci. It's been spelled both ways. Is there a significance to using either the "i" or the "y"? We are having a difficult time finding family history. I saw the comment on the "Busay" name. Would the name "Goncy/Gonczy" mean 'from the town of Gonc'? One city of origin was Szaszfa. Does anyone know any information about that area? Hi, Both My parent s were refugee in 1956. We lived as a nuclear family in Phoenix, Arizona. My mother raised my brother and I sharing rich memories of her upbringing and country's history. She lived her WWi memories in first person recollection to us. She told of her escape journey. The repression living int he Communist era. I was fortunate enough to take a tour of Europe in 1981 before the Iron Curtain was lifted. We have traveled back to Budapest several times the latest being 2 years ago. I was able to see before my eyes the character of the people and the changes the country has gone through the last 35 years.My first visit was sad as I saw bullet holes in unpainted walls left as reminders of the Oct 23rd revolution. Today there are bronze spheres in newly restored walls marking those spots to serve as reminders of their freedom. I always felt different than my peers with my lack of religious indoctrination and other aspects. I could never figure out why my mother had such distrust. This article gave me an AH-HA moment. Everything I had questions about fell into place. This is an excellent treatment of the country and culture from the perspective of this first generation American. The information is spot on. My paternal grandparents were both born in Hungary. My father and his siblings were born in Ohio, USA. When I was a child, my grandma would tell stories about her life in the 'old country'. I am fortunate that my grandma lived long enough to share so many things with me. She taught me to embroider, quilt, and cook/bake. She could make a filling meal out of nothing. We always had enough food to feed 20+ extra people. After my grandparents pasted, my mom, dad and sister went to Hungary to visit areas my grandparents and other friends of my father were from. My mom brought me back a cookbook "The Cuisine of Hungary " by George Lang. It is still a wonderful read. The first third of the book showcases which parts of Hungary certain recipes are from. And then the recipes...I learned to love even more foods. Your article hit on some of the information in this book. Great work. Thanks. for # 26, joseph krismavitch: My maternal Grandmother's maiden name was Eva Krismavitch. She was Croatian and migrated to the USA in 1907 after she married my Hungarian grandfather, Peter Kovac. She lived in or near Budapest. Her brother migrated here at about the same time with his family. They lived in Joliet Illinois for most of their lives. My grandmother died in 1951 or 1952. I hope this helps you find your roots. Hi, my name is Miriam Csanki and I'm 1/4 Hungarian. My grandfather was born in Hungary and was in WWII and came to Australia as an immigrate. I love the Hungarian culture and would love to know more about it but especially about my last name Csanki pronounced (Chanki), I get teased a lot about my last name because its from Hungary and so unusual in Australia. Can anyone tell me what my last name means and if your last name in Csanki? My name is Maria Nemeth. Yes the name in Hungary very popular. My father was in the uprising. He fled his native beautiful home to his life. Wanted so to get back. Circumstances failed him. But I as his daughter, returned for him met all my family. Now my eldest son lives with a Hungarian young women there. This piece I have just read such another piece of valuable information to my interest of myself of my heritage. My surname still tho don't no meaning? Please could you let me in on that please. Many many thanks to all, to for time in reading my comments and work was put into the write up of the information. I like this source because it helped me a lot. Our Social Studies teacher asked us to write a culture project about our family. I am part Hungarian, Italian, German, and Irish on my mom’s side. On my dad’s side I am part Irish and mostly American. This site gives me what my ancestors were like. If there’s a death in the family, do they bring food to the family? Anything anyone can tell me, greatly appreciated. They just moved to Los Angeles, so the family is living in USA. I'm ashok . I wish to visit this country. I wants to make some friends for my visit here. anyone interested please join me. Hi, I have become interested in various European customs. I have a friend who is 79 years of age in July, and he has met an Hungarian lady of 52 years of age, who lives in the United Kingdom, where also my friend lives. They met by chance while shopping and are now seeing each other. But a problem arose when the lady sent an email to her family in Hungary to tell them about the person that she has met. Her father stated after he foundout the age of my friend, that his daughter should not get into a relationship with this man, obviously his age is a problem and that if something happened to him i.e. he died, she would be without a home, is there a purpose by the family that could stop the relationship continuing or could it be because of the Church that the family are unhappy about the life their child could enter. Relationships in the United Kingdom are much more open and accepted than many countries in Europe. Would the high age be the problem or would it be a Church concern? My last name is Komonczi, my last name is of Hungarian origin. My family moved to the US around 1906. Other spellings on immigration forms include Komonczy. Does anyone from Hungary have any information on my name? Is it common? I'm doing some research on my mother's family, who lived in KURIMA (just outside of Budapest). Her great-grandfather's last name was WEIL; he was evidently a mural painter for homes in Budapest. His children came to the US in the later 1800's (maybe the 70's or 80's). Wondering what life was like in the "suburbs" of Budapest in that time period. Does anyone have sources? Thanks!